What is the best word to describe this movie? I would say it is enthralling. The cinematography is stunning. The vastness of the Mongolian steppe would leave no one indifferent but captured in such wonderful pictures there is no escaping the enchantment. These amazing views are underlined by one of the most convincing scores I have heard in any movie recently. Chanting monks, female singers, musical parts. Picture wise it did remind me of Urga aka Close to Eden, a gorgeous Mongolian movie I haven seen a few years back. We can easily deduce that material life in the Mongolina steppe has not changed much. People still live in yurts, even the clothes bear a certain resemblance. The Russian movie Mongol is the first installment of a trilogy on the live of Genghis Khan. 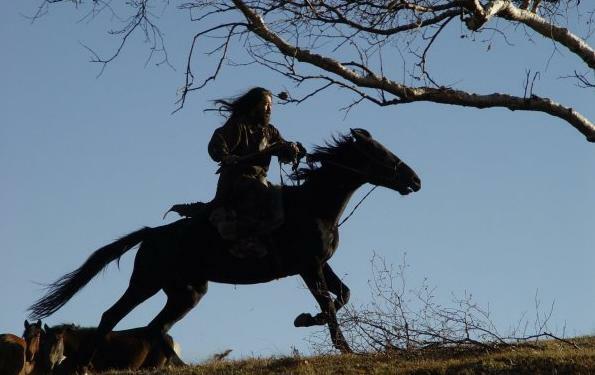 It shows his childhood, how he chose his wife Borte (Khulan Chuluun), the great love of his life, how his father is killed and how he later has to fight for his survival until he becomes the unifier of the Mongolian tribes and their leader. He is not yet called Genghis Khan, he is still Temudjin (Tadanobu Asano) a boy from a modest background whose father was one of many Khans. Life at those times seemed to have been incredibly hard. The tribes were stealing from each other (horses and women), assaulted each other, killed each other. It is hard to imagine a life of greater insecurity than this. Whenever the future Genghis Khan triumphed over someone he was shown as very just and generous. As a consequence of this behaviour people wanted to follow him, they chose him as their leader. The Genghis Khan we see is someone who inspires pity because of the hardships he has to endure and admiration for the way he treats people, especially his wife to whom he is very attached. I cannot say much about the historical accuracy. Usually Genghis Khan, who was once the leader of the greatest empire that ever existed, is shown as a merciless cruel despot. There is not much room for beauty in those tales of his life. I tried to find out more and apparently it depends on the sources that are being used whether his portrait is more negative or more positive. I was fascinated by the spiritual aspects in the movie, the deity that appeared in the form of a wolf. The wolf is very meaningful to the people of the Mongolian steppe. Certainly the depiction of the Mongolian religion is not accurate but I liked this dimension. I thought the acting was excellent but have read that it has been criticized that a Japanese actor stars as Temudjin. The accents of the actors seem to be painful to Mongolian ears as well. I even read that some actors spoke Mandarin Chinese which was not yet spoken at the time… I don´t speak any of those languages therefore I was not bothered. I think this is a very special, aesthetic, riveting movie and I am not surprised it was nominated for an Oscar and won many prizes. 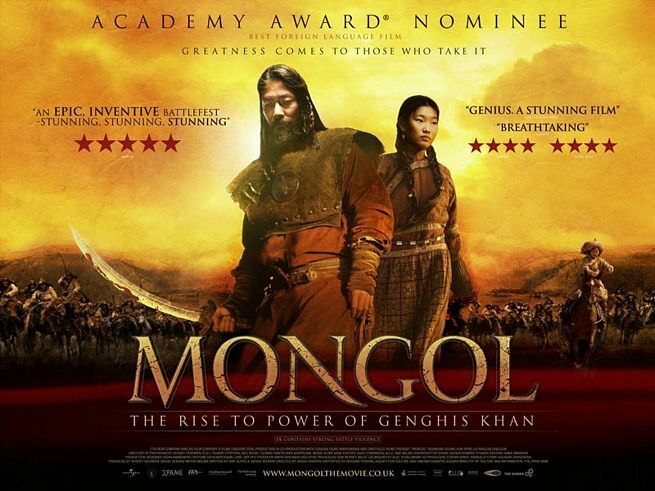 This entry was posted in History, Reviews, War Movie and tagged History, Mongol: The Rise to Power of Genghis Khan., Movies, Reviews, Urga, War Movies. Good review. Something I liked more or less is that it did not seem to have much of what is called “gratuitous violence” or situations where some popular character gets killed or had a lot of blood versus say War Lords which this movie seems bound to be compared with, if only in that it is a bit of a contemporary. In a way, it was like Bonanza in the Far East, almost and it is almost suitable for all viewers. I just have to say, I lent the movie to an Egyptian friend of mine. I believe some biographers say Genghis Khan died in Egypt. I don’t know for certain and I will discuss it with him. I do remember when this movie was released so felt a bit fortunate to be able to see it now. Thank you for answering the question as to this being a Trilogy, I did wonder. And thank you for your time and your blog. As far as violence goes this was not too bad (unlike Centurion that I reviewed two days ago) but I am afraid this will be different should they really do a second and a third part. Would be curious to know what you friend says. Do Egyptians relate to him at all? Thanks to you for reading and sharing your thoughts on my blog. I really appreciate it. The website and this blog shall be always recommended by me as one of the most ambitiouspoint of this topic. Well, thank you, that’s nice. This is one of my favorite movies ever. I agree with your review and can’t believe it didn’t win the Oscar it was nominated for. You wouldn’t believe how many people I’ve had to force into sitting down to watch it with me. Most are put off by the foreign language aspect of it and don’t believe they can enjoy having to read the captions. This is a short lived misconception. Everyone who has given in has thanked me afterwards! You are so right about the soundtrack, it’s absolutely amazing! I’m particularly fond of the Mongolian heavy metal during the end credits! It is an absolutely stunning movie and I would wish there would be more like this. The language is often an issue, people don’t want to read when they watch a movie and it can be distracting. I find it especially problematic with older European movies where the subtitles are often done badly but I had a feeling the translation was well done here. In any case, this is a movie to re-watch. I was also fascinated by the story, had no idea what kind of a person he was before he became Genghis Khan.